The Light Machine Guns of Sweden. 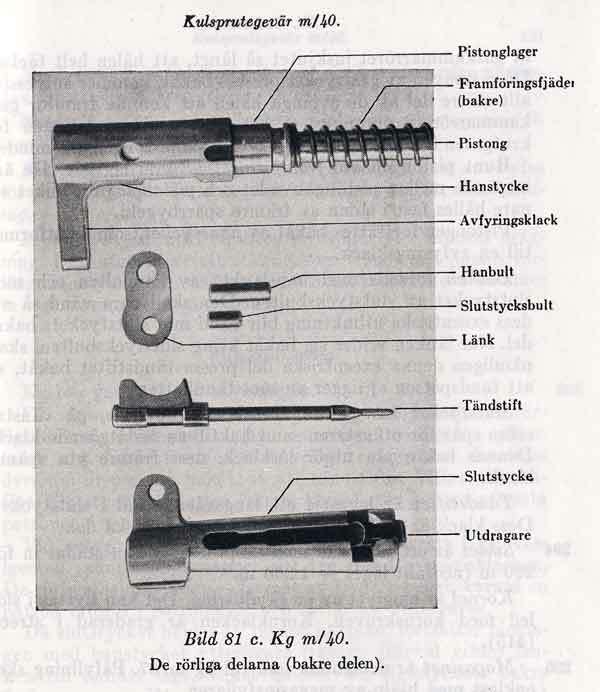 Index for the Swedish LMG:s - Kulsprutegevar. LMG BAR-family in Sweden. Kg m/21 & Kg m/37. Light machine gun Kg m/1940 (SAV). I want to give special honour to Stellan Bojerud who supported me with information. LMG Fm/1940 which became LMG Kg/1940. and the Knorr-Bremse Machine Gun. Notes from lecture held by (ret.) Col. Stellan Bojerud at Gothia Arms Historical Society. The Swedish light machine gun (LMG) m/40 has for more than sixty years had an ambiguous background history. According to the Swedish arms historians were the originators of the weapon two unknown designers named Lauf and Przkalla in Germany, where it was manufactured by Knorr-Bremse AG, which was a large industrial company that was specialized in manufacturing air brakes for trucks and rail vehicles. German army adopted the weapon as the MG 35/36, but it was made known not in large numbers. 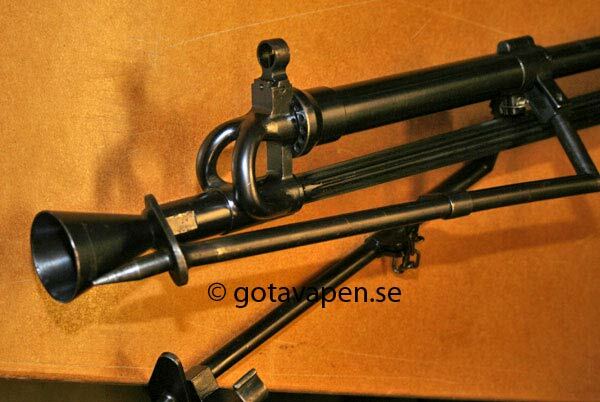 It is not known how the gun came to Sweden but it was manufactured by the company Swedish Automatic Weapons (SAV), which was led by Major Torsten Lindfors. Beside the company name nothing is known about the company Swedish Automatic Weapons, not even were offices and factories were located. However German sources say that the weapon was designed by Torsten Lindfors in Sweden and that the patent subsequently acquired by Knorr-Bremse, which produced weapons for the German army. The German Machinegun M35/36 is usually called for Knorr-Bremse in weapons history literature. Submachine Gun m/40 was a rather unsuccessful design, which among men was notorious as "Galloping Iron Bed" as a result of the severe vibrations during firing. The Swedish Home Guard were equipped with these weapons during the WW2 period, but then they were exchanged as quickly as possible for the 20 year older Light Machine Gun m/21 Colt-Browning manufactured by Carl Gustaf Gun Factory. At first glance, machine guns m/40 appear as a modification of the MG 35/36 Knorr-Bremse, or vice versa. Closer inspection reveals that the differences between these types are so big that they should be regarded as two different weapons. Of the extant patent documents, it appears that the forerunner to LMG m/40 was designed by Hans Lauf. The patent was originally outlet in Sweden with Priority Date 22 November 1933. This weapon was called LH 33. Hans Lauf was the director of Magdeburg Werkzeugmaschinenfabrik AG which was founded 1892. He was a skilled technical designer, who in 1909 took out a patent on an improved turret lathe. 1923, he bought up failing Schweizerische Werkzeugmaschinenfabrik Oerlikon in Zurich. Hans Lauf then sent his associate Emil Georg Buhrle to Oerlikon to be the manager there. Buhrle 1914-1919 had been a cavalry officer and was subsequently employed at Magdeburg Werkzeugmaschinenfabrik AG. Hans Lauf managed to make 1924 a secret agreement with the German Inspektion Waffen und Geräte ins Reichswehrministerium, which meant that the German army would materially and financially support Laufs weapons designs abroad. The Versailles treaty had forbidden any development of new weapons in Germany. Emil Buhrle rebuilt in 1924 along with Major Waldemar von Vethacke on the premises of Seebach to the weapons factory. Swiss documents reveal that Hans Lauf 1924 placed development and production of weapons to Werkzeugmaschinenfabrik Oerlikon. It was therefore most likely in Werkzeugmaschinenfabrik Oerlikons weapons shop in Seebach as the first prototype of the weapon, which was designated LH 30 was developed from 1929 to 1930. On December 29, 1930 has George Thomas, Chief of Staff at Inspection Waffen und Geräte ins Reichswehrministerium, written a note, that Hans Lauf had fulfilled its obligations relating to weapons development. George Thomas became General of Infantry 1940, but as an opponent of Nazism, he was arrested in 1944 and put into concentration camps. He was freed in 1945 by U.S. troops, but died the following year as a result of its hardships. Emil Buhrle bought gradually shares in Werkzeugmaschinenfabrik Oerlikon in 1929 and he became majority owner. 1936 he became the sole owner of the company, whose president he was until his death in 1958. Production was gradually concentrated to 20 mm anti-aircraft cannons, which were marketed by Major von Vethacke and selling in quantities all around the world. 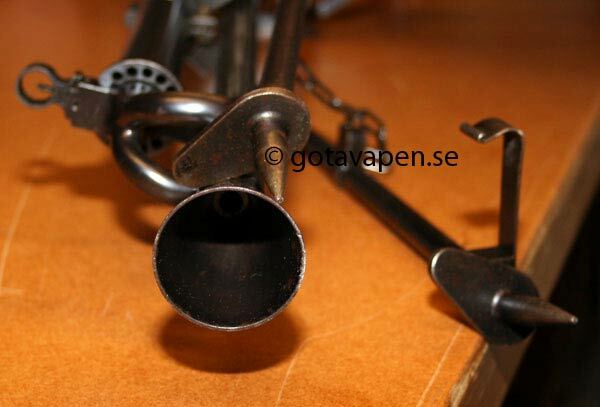 The following model of machine gun, which was designated as LH 33, is patented in many countries on the basis of the above mentioned Swedish Patent Priority Date 22 November 1933. Most patents are registered in Ivar Joseph Stack, Vartavagen 18, Stockholm, and Axel Torsten Lindfors, Grevturegatan 5, Stockholm, but the patents in Canada and the United States was held by Hans Lauf, to the alleged address in Stockholm, Sweden. 1933 Hans Lauf took contact with patent engineer Ivar Stack at Stockholm Patent Office. It seems that Laufs cooperation with Buhrle ceased after he obtained a majority in Werkzeugmaschinenfabrik Oerlikon or Lauf wanted to mislead authorities due to the Versailles ban on German weapons development, by acting in Sweden. Swedish companies were common as fronts for German weapons designers, such as AB Aerospace in Limhamn, who was a front company for the German aircraft designer Hugo Junkers. Ivar Joseph Stack (1887-1957) was a civil engineer and since 1910 the an officer in reserve at Norrland Artillery Regiment (A 4) in Ostersund, where in 1927 he was promoted to captain. 1933 he was mentioned working at AB Stockholm Patent Office. Ivar Stack involved Artillery Captain Torsten Lindfors as employee. During the mid-1930s, Torsten Lindfors searched unsuccessfully marketing LH 33 in numerous countries, among which the UK where the weapon was known as "Lindfors gun." LH 33 was hand-made in caliber 6.5x55 mm. 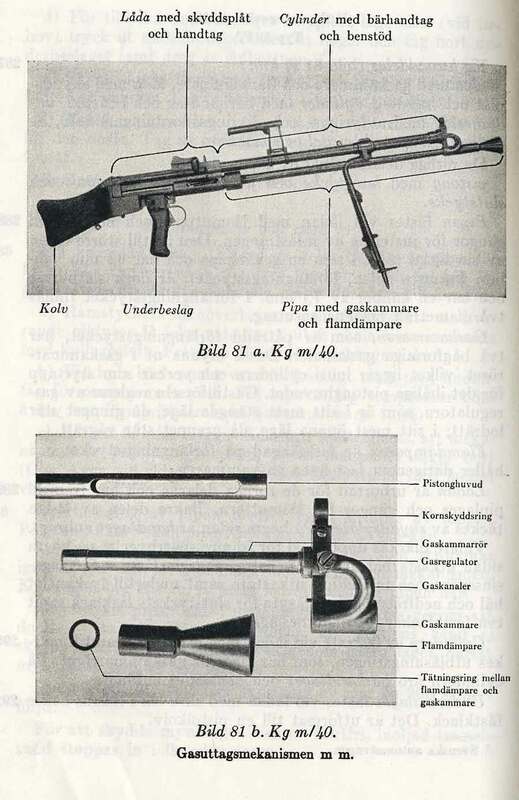 By the Swedish Army Ordnance Deparment (KATD) a register of equipment trials from 1931 to 1937, it appears that no tests were made with LH 33 in Sweden, which does not hinder that Lindfors could have demonstrated the weapon, but that KATD not found any reason to make a real attempt. Swedish army was at this time on the recommendation of the 1921 Infantry Commissioner equipped with Light Machine Guns m/21 (Kg m21) type Colt-Browning. There were 7571 such weapons, including 500 guns manufactured in 1918 along with the licensing rights purchased from Colt Firearms Incorporated in Hartford, Connecticut, USA and the rest from 1923 to 1935 produced by Carl-Gustaf Gun Factory (GF) in Eskilstuna. KATF acquired in 1935 for trial 40 type Light Machine Guns Colt-Browning fm/35 from Fabrique Nationale d'Armes de Guerre (FN) in the Brussels-Herstal, Belgium, as a basis for improvements Kg m/21, which was fitted with an interchangeable barrel and was adopted as kg m/37. It would have been irrational from many reasons like educational and maintenance to exchange the proven Colt-Browning concept to LH 33 unless the latter weapon had proved to be much superior. In the spring of 1935 said chancellor Adolf Hitler one-sided cancelled the Versailles treaty and arms production was again possible in Germany. In the same year Magdeburger Werkzeugmaschinenfabrik AG was sold to Junkers Flugzeug-und Motor Werke AG. Hans Lauf went on to become director of the Knorr-Bremse AG in Berlin-Lichtenberg. German army adopted the weapon as the MG 35/36 in caliber 7.92 mm, but it was rejected almost immediately in favor of the vastly better MG 34. The main reason was the MG 35/36 had a low rate of fire, only about 480 rpm. Production of the MG 34 was not sufficient to cover the need for weapons of the rapidly expanding German army, as from 1935-1939 increased from 10 to 103 divisions. For this reason Waffen Fabrik Steyr 1939 was contracted to produce 500 copies of the MG 35/36. Further improvements were made the same year, which were patented by Wendelin Przykalla (not Przkalla), who was a constructor at Knorr Bremse AG. By time the German war efforts concentrated to superior Machineguns like MG34 and later MG42 and the MG 35/36 became obsolete. When the war in Europe started September 1, 1939, the Swedish arms industry was fully occupied with forced production to meet the war organization. Field Army, between 1937 and 1940 increased from four to six divisions and allow the Home guard to be upgraded. As for small-caliber weapons, there were at that time only two qualified manufacturers in Sweden, namely the state Carl Gustaf's GF in Eskilstuna and Husqvarna Weapons Factory AB (HVA). Royal Ordnance department, KATF, ordered all weapons from the gun factory, which in turn subcontracted some orders with Husqvarna. As early as 1938 there had been proposals to form a Home Guard in Sweden and the discussions had been held over the course of 1939 but by the German attack on Denmark and Norway April 9, 1940 the question became acute. 100 000 military personel. Defense Minister Per Edvin Sköld said: "We call for arms!" Torsten Lindfors saw the difficulties and opportunities already managed to June 14, 1940 interest KATD for a version of the submachine gun type LH 33 LH named LH40 This could either have been a modified version of the LH 33, or more likely only a re-designation to give the impression that the design was more modern than it was. The demand for the Home Guard was 8000 LMG and CG GF production of 400 Kg m/37 per month was not enough to fill the rapidly expanding Swedish Army. Kg m/37 had until October 1, 1940 manufactured in 1726 examples and CG GF had orders for a another 4984 such weapons, which meant that factory capacity was occupied until at least October 1941. The LMG type LH was cheaper than m/37 and to manufacture and handle. It could be produced in addition to the ongoing production at the CG gun factory. Carl Gustaf Gun factory had a high capacity to manufacture rifled gun barrels, namely 1300 pieces per month. The manufacture of a rifle barrel required 36 operations, which took approximately two hours. CG GF managed thus to make pipes, both for themselves and a possible new arms producer. On June 21, 1940 a number of industrialists formed a company AB Emge (Reg No. 39 440) to engage in manufacturing and trading operations. One of these men was Torsten Lindfors. The company share capital was 200 000 Swedish Krona (SEK). AB Emge symbolize the letters MG, i.e. Machine Gun. CEO was Erik Hjalmar Lindstrom, but the marketing seems to have been handled by Major Torsten Lindfors. On 29 June 1940, AB Emge got a contract for 2500 machine guns m/LH40 for delivery during the period from January to May 1941 with 500 pieces per month. The KATD was forced to make this deal because AB Emge must have governmental guaranties to ensure a sufficiently large volume of weapons, that it might be worthwhile to build a production line. The contract price was 1002.24 Swedish Krona (SEK) per weapon, out of which CG GF would have 54 SEK for barrel and sights. AB Emge was renamed to “Industri AB Svenska Automatvapen” (SAV) on the 23rd of September 1940. SAV has been difficult to identify because in the archives the company name was filed under letter “I” like in Industry! On December 3, 1940 squad attempts should be made with machine guns fm/40. The disposal was initially a dozen hand-made LH 40, which were supplied by SAV. 20 pieces were judged available in early January 1941 and 300 mass-produced weapons were to be delivered prior to January 31 1941. Field experiments were carried out at Harjedalens Infantry regiment (I 35). This regiment had been hastily assembled from other units. Comparative tests should have be executed with both kg m/37 and kg fm/40 between January 20 and March 8, 1941, but they only started January 28, 1941. As early as February 11, 1941 the attempts were interrupted due to accidents and malfunctions of fm/40. 100 weapons were returned to the SAV for improvement. On March 4, 1941 Captain Sven Hodell from the gun factory carried out comparative trials of kg m/37 and kg fm/40 (fm=test model). The experiments took place in the northern parts of Sweden at the 3rd company of Infantry Regiment 35 (I35). Captain Hodell reported on kg fm/40 among other things, that "only one of several tested worked." Although the engineer Svedberg from SAV was present, the weapons repeatedly stopped. According to Captain Hodell this wasn’t only due to the firearms, but also on the team's low education status, which meant that attempts with Kg m/37 was just as bad. Kg fm/40 had technical problems, but showed better accuracy results than Kg m/37. On June 16, 1941 were new comparative trials with Kg m/37 and Kg fm m/40, this time in the southern parts of Sweden. The experiments were done with five guns of each type. All previously made kg m/40 had been returned to SAV for adjustments. These five weapons were borrowed from SAV. Three of them were assembled of parts from previously discarded weapons and two other were new. The results of the experiments showed that Kg fm m/40 was not yet suited for mass production. There had been hopes that the cheaper Kg m/40 could replace m/37, but July 7, 1941 KATD took the decision to continue production of Kg m/37 for the Army, as the Kg m/40 was not yet suited for mass production. However on August 21, 1941 it was notified, that mass production of 2500 Kg m/40 begun and that the final delivery was set or December 1941. By then, more than a year has passed since KATD ordered the first series of 29th of June 1940. SAV was the fall of 1940 quickly built up a production line, but the precision manufacturing was poor and large quantities of weapons were returned for corrections. KATD found that SAV wasn’t a real manufacturing plant, but purchased parts from suppliers and joined them. From gun factory SAV purchased barrels and sights, while other parts were made by various mechanical engineering companies. SAV had established its office at Stallgatan 3 in Stockholm and had the composition workshop in Little Alby. It’s clear that the workshop was in Little Alby from data in KATD archives, but not the exact address or the layout of rooms. It is not known for sure, but probably SAV had two barracks in 1940 at Hamngatan in Little Alby. These were used after WW2 as forging workshops and according to information from local people these had been used for manufacturing of weapons. The barracks were demolished in the 1960-ies. On January 1, 1942 it was reported that the 2111 weapons of 2625 ordered had been delivered. This was part of already 1940 ordered 2500 guns. Another order was placed for an additional 125 weapons in autumn 1941. The latter weapons would be delivered before 30 April 1942. It was also noted that 180 weapons would be returned to SAV for correcting adjustments. The price had now fallen to 772.20 SEK per piece, because the investments in the production line were already paid by the first order. Deliveries of the new series of 2300 weapons were somewhat delayed, but was completed in September 1943. It had delivered a total of 4926 weapons, including one for unknown reasons beyond the contract agreement. Danish and Norwegian Police troops and gifts. In 1944 began the training of Danish and Norwegian troops which were called police units in Sweden. Those received Kg m/40, but the Danes were so displeased with their weapons so they were exchanged for Kg m/37. The Norwegians showed greater tolerance and adopted Kg m/40 as MG 40, which was purchased in 480 pieces. The procurement of the fourth series of 480 guns were made by the Norwegian government in exile. Of the surviving weapon numbers can be concluded that the KAFT sent Swedish Home Guard weapons to the Norwegians and then had to recover these through the fourth production series. Altogether a production of 5406 pcs Kg m/40. Of the currently known manufacturing number of Kg m/40 is 5181 and 5179 both in Home Guard Museum at the National Home Guard Combat School (HvSS) south of Stockholm. Both were donated to the museum from private home defense areas. This suggests that they are gifts, acquired directly from the home guard units and paid for by money collected by civilians or donations. The Home Guard had a large number offered weapon, among which not least Mauser rifle m/96, that in moments of danger had been donated to the Home Guard of individuals. Thus, it may have been manufactured more than 5406 weapons, which is evident from remaining documents. There is as yet unverified information that the 500 copies of the MG 35/36 1939 were manufactured by Steyr were destined for the Waffen-SS. 1939, the Waffen-SS was still a small organization and the German Army was unwilling to supply it with the standard Machine gun MG34. However it circulates strange information about guns found marked by Waffen-SS in caliber 6.5x55mm, which seems less likely when the German standard was 7.92x57mm. MG 35/36 Knorr-Bremse and Kg m/40 SAV are two different types of Machine guns. Kg m/40 was developed in Sweden directly from the prototype LH 33, renamed and possibly modified to LH 40. 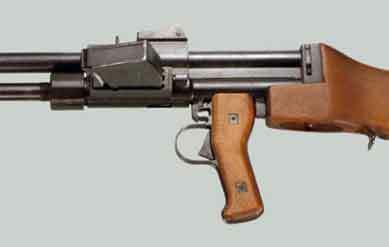 It was made in caliber 6.5x55mm by Industri AB Swedish Automatic Weapons (SAV) in Little Alby, Sundbyberg and with barrels made by Carl Gustaf Gun Factory in Eskilstuna, Sweden. The German MG 35/36 is however a significantly altered and further developed LH 35 and LH 36 at Knorr-Bremse AG and with the improvements patented by Wendelin Przykalla. These LMG were made for caliber 7.92x57mm by Waffen Fabrik Steyr. Arkiv 420209 Patent- och registeringsverket, Bolagsbyrån. Aktiebolagsregistret. Signum D 2 C Vol 13 resp D 1 AA Vol 739 nr 39 440. Arkiv 062 C Arméförvaltningens Tygdepartement. Civilbyrån. Kontrakt. Signum E II a Vol 1. Arkiv 006 H Arméforvaltningens Tygdepartement. Första materielbyrån. Inkommande och utgående skrivelser 1937-1942. Signum F Vol 18. Arkiv 224 H Carl Gustafs Stads Gevrsfaktori. Utgående skrivelser 1931-1943. Signum B Vol 2-6. The mechanism works like the Swedish kg m/39 (BRNO LMG ZB26). When the bolt locks its rear end is pressed down to lock against the locking edge in the bottom of the receiver. Kg m/40 was produced by Svenska Automatvapen AB (SAV), though all parts were manufactured by various contractors in the Stockholm area. SAV was only responsible for the assemblage of the guns. Kg m/40 fires only full auto. It is possible to shoot single shoots likewise with the submachine gun m/45 by very fast releasing your finger from the trigger. The handle and the bipod are fixed to the gas-cylinder! Test model based on LH 33 with double trigger (for selective and full auto) similar to MG34 and grip safety. 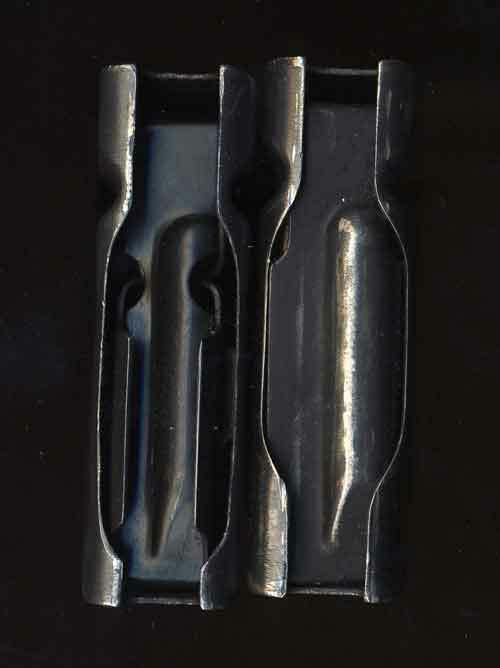 The m/40 used the same, 20-round magazines as the Kg m/21 and the kg m/37 (BAR), inserted from the left hand side. A similar gun was made in Germany by the manufacturer Knorr-Bremse. The FG.42 made by Krieghoff was based on MG 35/36 used the same system with magazine inserted from the left, just in front of the shooters face. 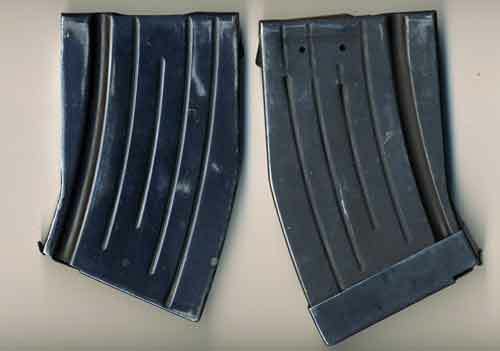 The m/40 magazine has a reinforcement across (see pictures) which is different from the m/37 magazine but they are interchangeable in Kg m/21 and m/37. Note that there is a special guide inside the m/21 magazine to guide the cartridges in a careful way to avoid malfunctions in the kg m/40. 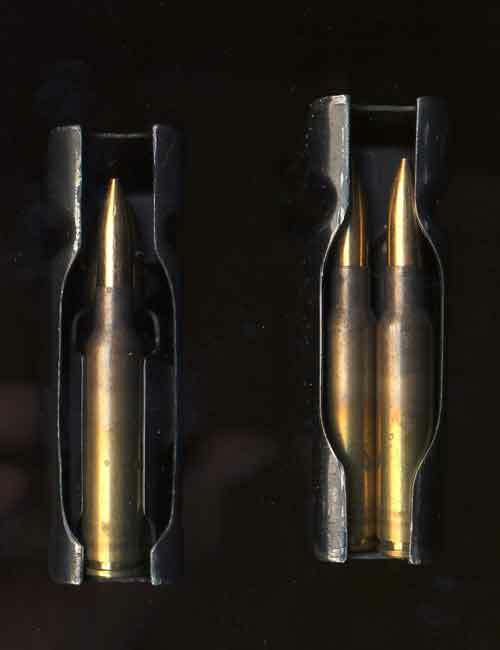 Here you can see how the cartridges are arranged in the magazines. The m/40 soon became quite unpopular among the troops and it was quickly transfered to the Home Guard who didn't like it either and shortly after the war it was replaced by the twenty years older m/21. Top - trial model LMG Fm/1940 which became Bottom - the accepted LMG Kg/1940. Note that both handle and bipod of Kg m/40 are fixed to the gas-cylinder! Picture from Carl Gustafs Stads Gun Factory Weapon Museum. On this test gun the bipod is fixed to the gas tube while the handle is fixed to the barrel. Ian Hogg Military small arms of the 20th century.